Sometimes, I feel like I don’t have any friends. It's a deep-seated gremlin I’ve dealt with since childhood, best friends (ha ha) with Self-Doubt: you're alone because you don’t have friends, you don’t have friends because people don’t like you, etc. etc. We often talk to ourselves in ways usually reserved for Internet trolls. I've been thinking often on this theme for the past few months. The trouble with this particular gremlin is that there’s some truth to it: being a traveling dance instructor has brought me friends around the world, but they’re a certain kind of friendship. I don’t have friends I see all that often, the kind I can always call at any hour to hang out or talk, the kind where there’s a steady and regular connection, the kind that know me completely. Instead, I have friends with whom I’ll connect deeply for a couple hours a few times a year. I want (we all want?) to be understood, to be seen, so perhaps in some small way I blog because I want to be understood, since I don’t have the benefit of having someone to randomly chat with about these thoughts. Much of building friendships is about regular interaction, the exchange of little tidbits of intimacy. Sometimes, this social exchange can’t be proxied or skipped no matter the depth of connection. Being geographically untethered has been a privilege and introduced me to many wonderful people, but it also doesn’t leave me enough opportunity to build these bonds. Even if I were in the same place (as I’ve seen myself do more recently), life simply gets busy on both sides of the equation. I lose myself in my programming work and prioritize the next code commit over cooking properly for myself or spending time in the company of others. Programming is fun, addictive, and can seem so much easier than engaging in other enriching activities, much like watching TV or playing games. (Come to think of it, I’m very lucky to have found a profession that enthralls me.) Meanwhile, people in my circles are equally busy. I've been drawn to them because they're driven and inspired, they're doing a lot with their lives, and it means there's not time in the week for regular interaction. Time with friends usually needs to be scheduled, which leaves me in a conundrum on my days with nothing planned: I find myself craving social interaction, but only once I’m in the middle of a block of free time and everyone already is occupied. One solution might be to more proactively schedule my evenings with others. Generally my weekday evenings are left untouched, so I’ll find myself working late “for lack of other things to do,” but if I more proactively booked my evenings in advance this problem would not arise as often. In the vein of “reaching out,” I even find it difficult to do it when I’m feeling great. Inviting people to “hang out” does not come naturally to me, I never have the courage for it. (You may find it amusing that I would think it takes courage to invite people over, but for me it does. I don’t get it, but it does.) I’m bizarrely uncreative when it comes to thinking of activities. I’m utterly incapable of organizing groups of friends for a gathering; at best, I can arrange 1:1 interactions. Besides (I think to myself), it’s more fun to be here by yourself and just do some more work, isn’t it? I convince myself that I lack the energy for small-group social interaction, despite consistently finding these exchanges to be renewing. It feels like I missed this lesson in childhood, I never learned how to invite groups of friends, and now there’s this huge segment of valuable information missing from my knowledge base. Being a recurrent theme in my life, I've made it a new life project to address this feeling of not having any friends. During my journey at Burning Man, I set a new intention: to deepen connections within my friend sphere; this intention immediately began manifesting beautiful moments in life. That night, I went out on my own to see Beats Antique. It was a bitterly cold night, dropping below freezing. At the show, it took a while for me to get into the flow; the music was phenomenal, but there were just so many people there. Taking a deep breath and wading deeper into the throng, I found an ideal spot to set down my adventure pack and get my dance on. Before long, I was greeting others with a more open heart, giving hugs, jamming together a bit. This may seem like nothing substantial — it’s what I do all the time at dance events — but being at a non-social dance event gave it significance, for I haven’t been able to access that side of me. The network effect played its part as my connection with a single person expanded to include four others, all of whom were full of love and joy. As night gave way to day and the party wound down, we ventured out into the playa with wonderment in our hearts: what a truly amazing show that could captivate us and keep us in one place the whole night, what a fantastic gift of the playa to meet all these people with open hearts, and what a beautiful morning it was proving to be. We visited The Woman (an art installation) for a while and there greeted the dawning sun. We all got to talking about intentions we brought with us to the playa, and each vulnerable exchange was acknowledged and cherished. I heard poetry, stories, and shared intentions that took my breath away. Eventually, we visited Braccus, a well-known and beloved art car shaped like a dragon. There was a large crowd formed there, so we figured something good must be going on. We stumbled upon a phenomal group out of Australia playing tribal electronic music. We only caught the tail end of it, but the music was profoundly beautiful. After the show's conclusion, we decided to part ways -- hunger was at last besetting us, and it would soon be time for sleep. But we took a quick photo of us before we departed. With the setting of this intention, other parts of life have begun to fall into place. Everywhere I go, there have been wonderful opportunities to repeatedly connect with others. "Repeatedly" is the operative word here -- my travels have never been short on meaningful interactions with others, but they are typically one-off exchanges. With life moving so fast, I'm grateful for the opportunity to interact with the same people more frequently than once every couple months. I hope that I can continue to hold this intention in my heart and create a new space in my life for people important to me, to always remember what nourishes and sustains me. I'm deeply grateful for the moments that life has brought me since setting this new intention. Over the past several months, I have been gifted with wonderful opportunities to meet new people and deepen connections with people important in my life. It feels like there's a new chapter in my life, one where I finally get around to addressing this challenging aspect of my history. The past three dance events, Seattle Fusion Festival, bamBLOOZled, and Blues Muse, have felt like special opportunities to connect with friends. Without having to work at any of them, I could take the time to relax and enjoy time with my people. I'm fortunate to have a growing number of people in my circles who have known me for many years and seen me through many phases of life; there's something irreplaceable about such experiences. My birthday is just around the bend -- two hours from the time of this writing, in fact. I find myself returning to the theme of friendship around the time of my birthday, reflecting upon the people in my life. 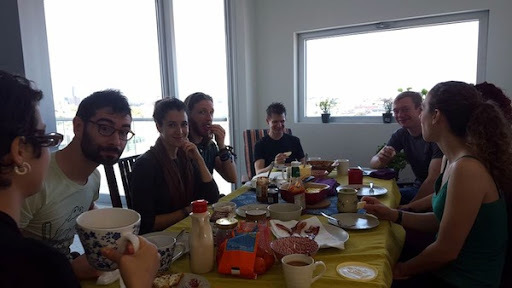 Yesterday, my partner organized a special birthday brunch with some my dear friends from Portland. I don't like asking to be the center of attention, but it feels super special when others make it so, which made this celebration all the more powerful to me. When I know I'm surrounded by and accepted wholly by friends, I can open up, be myself, and live vulnerably. I think the theme of friendship will always be a challenging one for me, as is often the case with deep-seated issues from childhood. But I'm grateful to find the universe offering so many great opportunities to process the emotions and to recognize how I am cherished and loved by many, and how insanely lucky I am for it.